The Vikings and Saxons made their homes and buildings in very similar ways. Transport was more difficult for them than for us so in most cases the materials used would be local, probably within a mile from the site of the building. 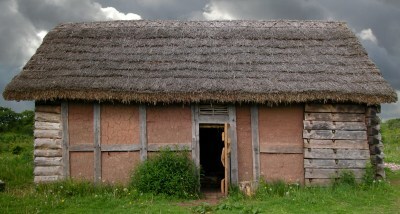 The 7th century Saxon style hall above is a reconstruction built at Bishops Wood which illustrates a number of different construction methods. The frame of the buildings were made of wood, usually oak but dependant on local availability. Trees would be selected, felled and then split into sections before final shaping with axe or adze. 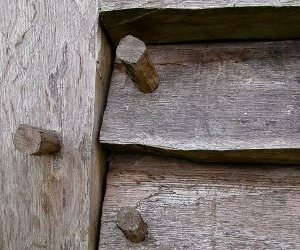 Joints were cut and pinned with wooden pegs or trenails, not just because of the cost and difficulty of producing metal nails but also because iron corrodes quickly in green oak. The roof was sometimes thatched with reed or straw and sometimes shingled with wooden tiles overlapping much like modern slates or roof tiles. Walls could be made with planks of wood, either each overlapping the plank beneath to keep water out or set vertically. Draughts could be excluded by stuffing any gaps with sheep’s wool or dried grass. Another method of wall building was wattle and daub. 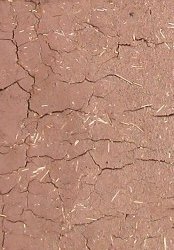 This mixture of daub is then “plastered” into the wattle frame and allowed to dry. Each method has its own advantages and disadvantages. Planked walls need good timber and skill to build. They stand up well against the weather and last a long time without maintenance. Wattle and daub walls are easy to build and maintain. They provide good insulation but they will deteriorate quickly if regularly exposed to rain or damp. It is a good idea to make your eaves extra wide to ensure good cover from the rain. Although often considered a poor mans option it is worth noting that a good number of original medieval wattle and daub walls still survive today in old buildings. Another method deserves a mention although it was probably not common in many areas. Dressed and mortared stone was used by the Saxons to build churches but dry stone walling was used by both Viking and Saxon builders in places where large amounts of loose stone could be found. Internal divisions if needed were often just wattle without the daub but most houses seemed to be undivided. A central fire place would provide heat and light and also be used for cooking. Smoke would rise into the roof space and either diffuse through the thatch or perhaps through vents under the eaves. 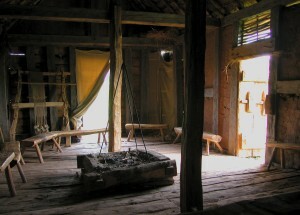 For more images of a higher status longhouse and banqueting hall see the Lofotr web page.